Thank you for your generosity & support in 2016. Wishing you a very happy & safe holiday season! 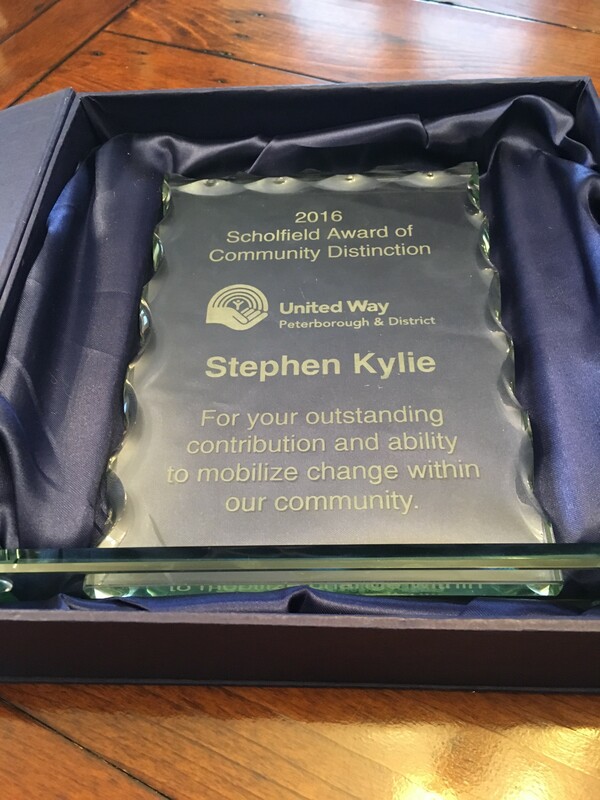 United Way of Peterborough and District today announced the 2016 recipient of the Scholfield Award of Community Distinction. The annual award was established to recognize an individual or organization for their outstanding contribution and ability to mobilize change within the community. Taking a lighter air, CEO Jim Russell noted that “at some point Steve is just going to have to start turning down awards and accolades, just out of fairness to others,” a reference to the fact that Mr. Kylie most recently won the Chamber’s Business person of the year as well as being appointed the incoming Chair of Trent University. Past award recipients have been Bill Strode, John Martyn, People First, Survivors Abreast, Marie Bongard, and Roy Brady. The Community Campaign Continues until January 19, 2016 and members of the public are encouraged to donate. Mayor Bennett brought greetings on behalf of the City and spoke to the important work of the City’s annual campaign. “It is hard work to pick a goal every year and then try to do a little bit better and I thank the committee for their hard work.” A cheque was presented to United Way in the amount of $75,822. This amount now brings the total United Way Community Campaign to just over 1 million dollars. United Way CEO Jim Russell noted that this is the point in the Community Campaign when larger workplaces are wrapping up. Russell said “For the last 5 years the City has hit its goal and we look forward to our larger workplaces that haven’t finished yet to help bring us home.” Included in this list are Trent University, General Electric, Fleming College and PRHC. With only weeks left in the Campaign the public are reminded that they can make donations online at www.uwpeterborough.ca or by calling 705-742-8839 or in person 277 Stewart St. These donations help to create hope and possibility for close to 60,000 people living in our community.